Female employment in Alberta is rapidly rising, as are average earnings. And today, more Alberta women in their prime working years are participating in the labour market than ever before, writes Trevor Tombe. Female employment in Alberta is rapidly rising, as are average earnings. Today, more Alberta women in their prime working years are participating in the labour market than ever before. In our fast-approaching election, the economy and jobs will be central issues. 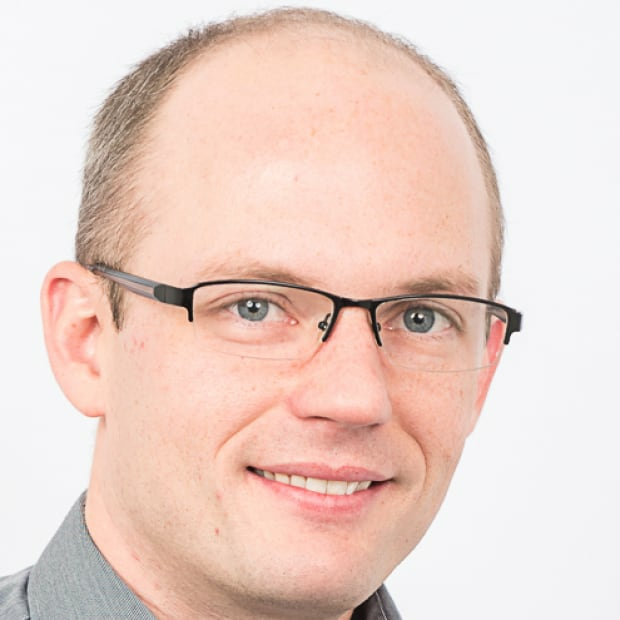 Is our economy strong, or is it weak? Is the recession ongoing, or is recovery underway? Simple questions, but the answers are complex. Overall, the economy is indeed growing and the recession is over. But not everyone experiences recovery in the same way. There are deep pockets of pain for some, but areas of genuine strength for others. 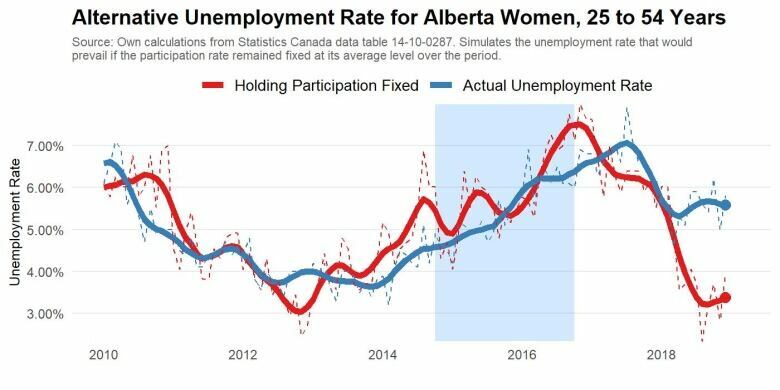 And there's perhaps no greater strength in Alberta's recovery today than recent employment gains among women. 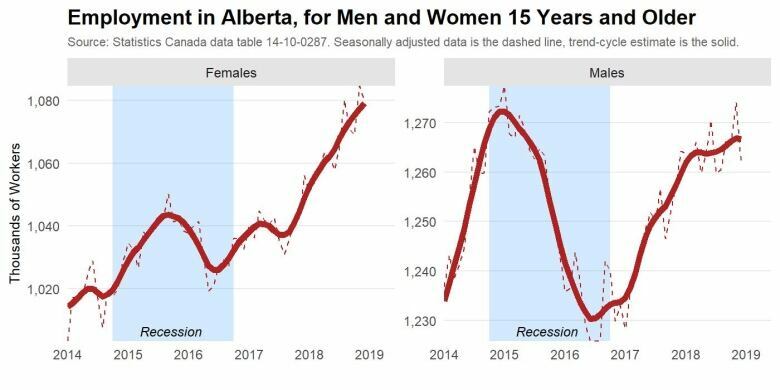 In short, Alberta women led the recovery through 2018. Every month, thousands of Albertans start a new job while thousands of others lose one. There's a constant churn of flows in and out. But by the end of 2018, over 21,000 more Albertans had jobs than one year earlier. For the economy as a whole, this isn't a large gain — and it was barely above what was necessary to keep pace with population growth. But when you split the gains by gender, the data tells a whole other story. As I show below, roughly 23,000 more women were employed at the end of 2018 than were employed one year earlier. This more than accounts for the province's total employment gain. The gains for women in their prime working years, 25 to 54, were especially strong. During the recession, we saw the share of women aged 25 to 54 with jobs fall from just over 77 per cent to a low of 75 per cent. But today, nearly 80 per cent of women in that group are employed — a significant increase. One has to go back to the 1990s to find an improvement in employment rates this large or this rapid. To be clear, the economy is not a zero-sum game. Gains to one set of workers do not imply losses to another. During the recession, job losses for men were larger than those for women, as oil and gas, construction, and so on, are male-dominated sectors. Now, during the recovery, gains elsewhere in the economy, in other sectors, are disproportionately benefiting women. These are broad-based gains that reflect a genuinely strong labour market. Employment in health and social services is up significantly, with nearly 23,000 more women employed there than one year ago. But the majority of these are private-sector jobs or self-employed women operating their own businesses. Female employment is up by 9,000 last year in business support services. Manufacturing and transport/warehousing are each employing nearly 6,000 more women than one year ago. In professional and scientific services, the number is up 3,500. Overall, more than 90 per cent of the gains were in the private sector. In 2018, the average weekly earnings for women were nearly $38 higher than in 2017 and $52 higher than in 2016. That means women made on average about $2,700 more in 2018 compared to 2016. Given such strength, more women are joining the labour force and looking for work. Many, many more. 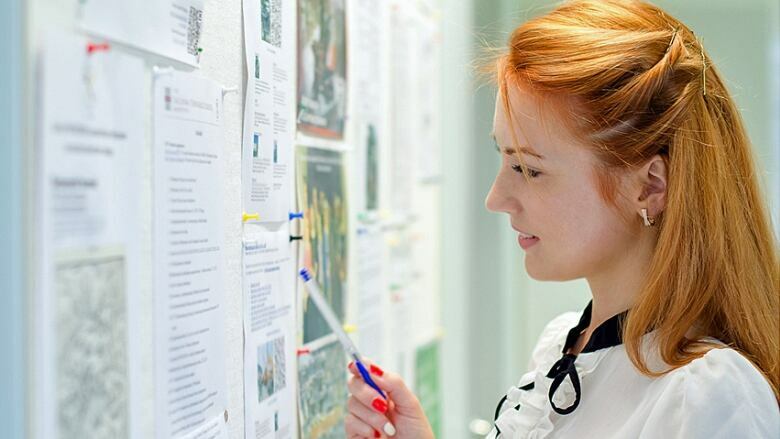 Roughly five in six women aged 25 to 54 either have a job or are actively looking for one. This is a larger share participating in the labour market than at any point in Alberta's history. Not only because these gains for women represent roughly 40,000 more individuals now searching for jobs, gaining employment, and earning income as a result, but also because it's an important positive development in the provincial economy as a whole — and one you may not have heard of before. It should change the way we see the recovery. Though weak for some, the recovery is indeed strong for many others. It's also important because it reveals why one common indicator of recovery — the unemployment rate — shouldn't be taken at face value. 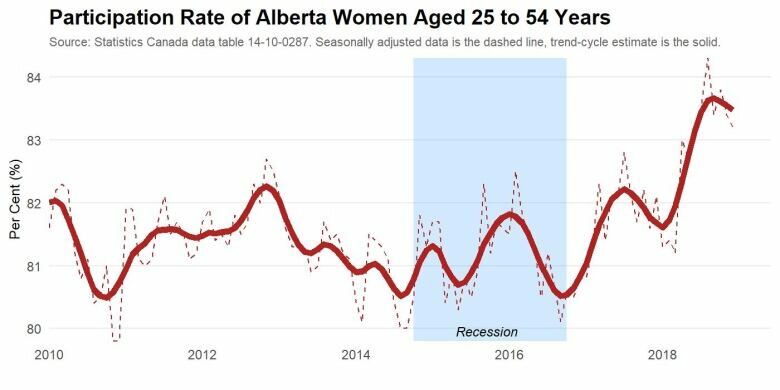 In December, 5.8 per cent of Alberta's prime-aged women were unemployed — barely lower than the 6.2 per cent one year earlier. But, and however counterintuitive this may sound, that isn't a sign of weakness, and it is consistent with the strong gains displayed above. We only count those who are looking for work as unemployed. If more people join the labour force and begin looking, the unemployment rate naturally goes up. But that's a good thing. 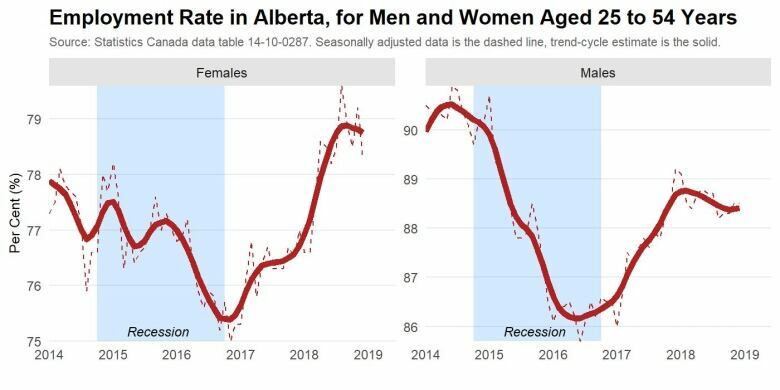 I estimate that, had the participation rate for Alberta women aged 25 to 54 remained unchanged, their unemployment rate today would have been closer to an impressive 3.5 per cent — better than before the recession. None of this is to say Alberta's economic situation is rosy, or that all women are seeing an improved labour market. The gains are larger in Edmonton than in Calgary, for example, and are exclusively among those with more than a high school diploma. Employment is down for both men and women among those with only high school education or less. And young workers face the largest challenges. Last March, I highlighted their difficult situation, and it hasn't yet improved. Today, if the recession never happened, roughly 40,000 more Albertans would have a job. Young workers ages 15 to 24 account for three quarters of this. These challenges deserve attention, of course. If we're to have any hope of addressing them, we must understand where they are. But Alberta's large and complex economy is not uniformly strong or weak. Despite real challenges, there is much going well. For Alberta women in particular, recent gains are very real and worth celebrating.